Just wanted to say thanks for doing great job. Things have worked very well. Extremely happy with web hosting and support. Very good plan. Excellent, quick customer service. Highly recommend! Great setup, cheap and very reliable host. Provide good value for money. Cheap price, 100% uptime and they have great support - recommend these guys. Unbeatable price for reliable service. Highly recommend this company. Excellent service, cheap price and very efficiently people. I have been working with EasyHost1 for over a year. The service and support are outstanding. I highly recommend them. As far as I know they are the best. Keep up the good work! I've been with EasyHost1 for about 2 years now. I've had no down time what so ever. 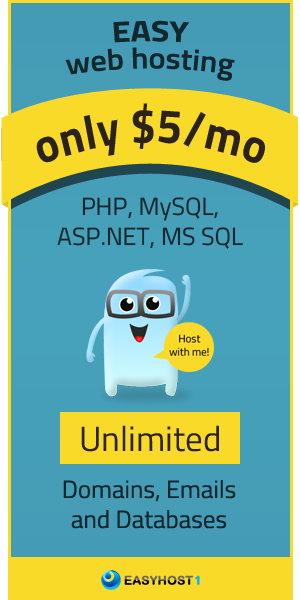 Great, cheap web hosting and no problems at all.